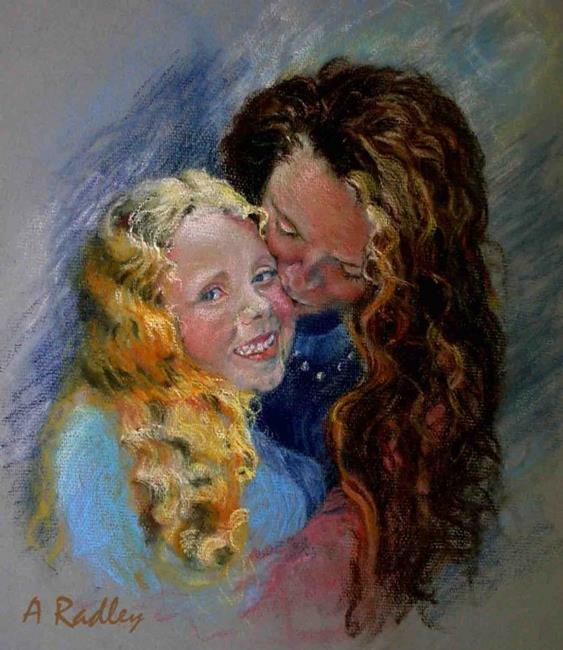 This portrait was commissioned by a grandmother - wanting to capture a precious moment of love between her only daughter and granddaughter. Both Emma and her daughter Kaya are dear friends of mine. Emma and I met as first time mum's with new born babes, when I was living in London. They are "familiar" to me, as family. In this portrait Emma is focused on adoring her little girl, while Kaya seems focused on being adored, as well as being beautiful. Both ladies were proud of their thick lush curls, (as well they should be) and wanted them to be beautifully portrayed. The rough texture of the Strathmore pastel paper worked well in this painting to convey the rich texture.